Cette maison personnalisé 3200 sq. Ft. Est entouré par une vue imprenable sur le Vermont et le New Hampshire. La mise en page et d'une orientation sud-est offrent des chambres spacieuses et ensoleillées. Idéal pour divertir. Grands levers de soleil. Les 4 chambres et 3. 5 salles de bains comprennent deux suites de maître, d'une salle de bain qui dispose d'une grande baignoire à remous entouré de fenêtres pour profiter de la vue montagneuse. La cuisine et salles de bains modernes comprennent des armoires de cerisier et les carreaux de céramique partout. La grande salle lambrissée d'acajou, la véranda, le hall en marbre, deux poêles à granulés et le mur intérieur en verre teinté au plomb, contribuent au charme et au confort de cette élégante maison de campagne. Situé sur 12 acres dans un cadre très privé. Les tarifs de location varient selon les dates et le nombre de jours de location. S'il vous plaît renseigner. Three couples, friends for more than 50 years, rented the property over the July 4th holiday. We found a wonderful house in Jamaica VT. Arriving at this spacious house set high on a knoll with tree-covered hills stretching before us we met Greg, (the owner) who opened the door and showed us the nooks and crannies. The views were spectacular. This we would say at least 10 times a day as we oohed and awed whenever we looked outside. The house had 4 bedrooms, 4 baths, sitting areas throughout the house so that each of us could find a quiet space whenever we wanted one. The big treat was the screened in porch, where we gathered in the morning for coffee, wine in the afternoon, and conversations at night. Waking to the glorious sunrises was the perfect antidote for tired bones. Coffee and glorious views what more did we need? Thursday dawned with a most beautiful sunrise. Clouds sat low in the valleys with the beginning sunlight creating waves of color. Since each bedroom has windows facing the east, it was a delight we all shared. We woke to an amazing sunrise on Friday with the realization that this was our last day together. We left with the refrain "until we meet again" By the way, our group chronicler is a poet." This was a great weekend rental for a getaway with friends! The house was immaculately clean and much, much bigger than we expected! 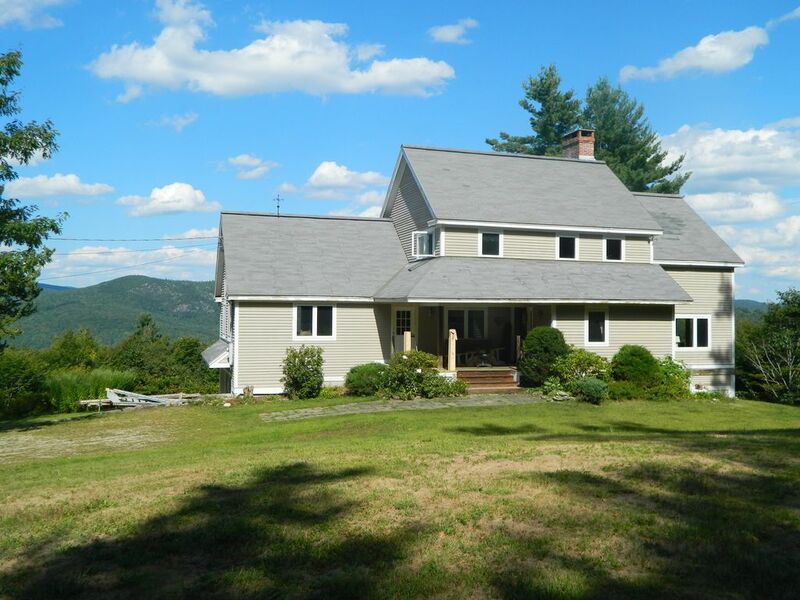 It's a great location with easy access to Stratton and Manchester. The only thing I would advise future renters is to know that two twin beds are in a loft above a living room/play room space, accessed by a ladder with no real privacy. Kids would probably love it, adults maybe not so much. This wasn't a problem for us as we were only a group of 8 . Thanks so much for your review!! Much appreciated- Glad you all enjoyed your stay. Great home, great views, great owner. My family and I stayed at this beautiful house over the Columbus day weekend, we were anticipating to be 10 people, some of us couldn't make it, but, even with 7 people, it was a lot of fun. House is big, you can't really tell from the pictures. Views from Bedrooms are amazing, foliage was peaking and weather held up. Greg, the owner, was kind enough to meet us to walk us thru for some details and was available thru out the weekend via text. It was super private in the woods, very nice and cozy, great retreat. This house is beautiful, and is true to the pictures and descriptions. The mountain views to the east are awesome! You have to work hard to see any evidence of civilization, it's that good. Makes for great sunrises too. Despite the seclusion and privacy, you are so close to Stratton. The house was well appointed, and had everything we needed for our stay. The house was very clean, and everything was ship shape. Greg and Eileen were great hosts, and even greeted us with a quick house tour when we arrived. We really enjoyed our stay there, and would not hesitate to go again, or to recommend to anyone! Rented this house for 5 months over the winter. Great location with spectacular views. Secluded yet still close to Stratton. It is perfect for 2 families with teenagers as there is a great room with ping pong, TV and loft beds apart from the rest of the house. Owner Greg was always helpful. Would rent again. Ski: Ski alpin et planche à neige à proximité. 5 miles à la route d'accès Stratton; 20 minutes à Mt. Neige, Bromley & Magic Mountains. Ski de fond, raquettes et motoneige sont tous acceptés dans les 20 minutes.